From bin men to builders, and postmen to pilots, Reservists across the country will today be wearing their military uniforms in their civilian places of work to celebrate their commitment to the Reserve Forces. Employers such as British Airways, Bentley, BT, Google, National Express, Rolls-Royce, Tesco, The AA and Vodafone, as well as a number of industry partners including BAE Systems, Carillion and Serco, have all shown their support today by holding events and seminars to promote the work of their employees who are Reservists; and have also invited their employees to wear their military uniform at work. 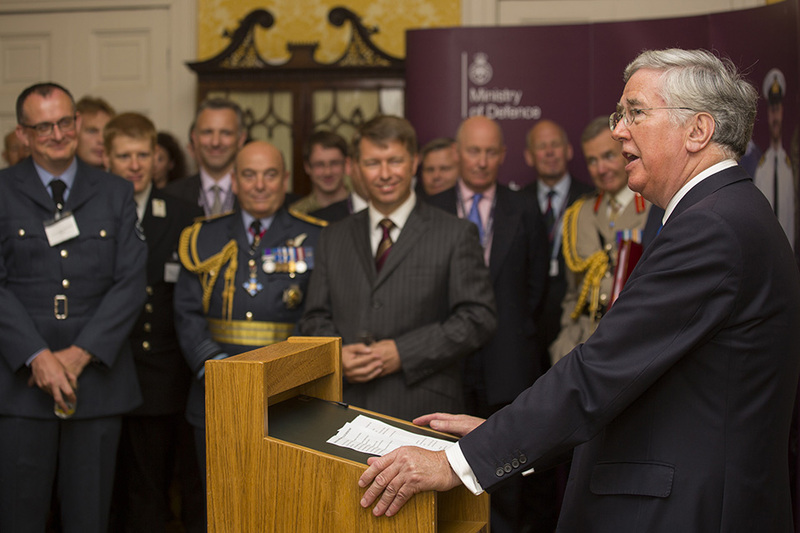 Reserves Day was also celebrated yesterday at an event hosted by the Defence Secretary Michael Fallon, at Admiralty House in London. 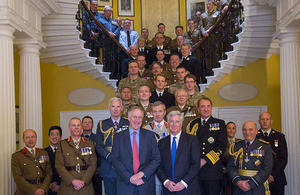 Ministers and senior military personnel attended and were joined by more than 20 Reservists and their employers as a way of saying thank you to those who continue to make the effort support the work of the Reserve Forces. Reserves Day is the moment to celebrate the bravery, sacrifice and service of all those who give up their spare time to protect our nation’s security at home and overseas. Today is our opportunity, on behalf of Government and the Armed Forces to recognise our Reserve Forces and to salute the supporting cast, those employers and families who provide the support and strength to ensure our personnel can keep on keeping on. Reservists give up their spare time to serve in the Reserve Forces, balancing their civilian life with a military career to ensure that should their country need them, they are ready to serve as part of the military. The Reserve Forces are represented across all three Services, and the Royal Marines, and make up approximately one sixth of the UK’s Armed Forces personnel. As such they are integral to protecting the nation’s security at home and overseas, and are currently supporting operations worldwide including in Afghanistan, Northern Iraq, Cyprus, Bosnia and Herzegovina and as part of the UK’s effort to counter Ebola in Sierra Leone. The contribution they make to our Armed Forces often goes unrecognised and as such Reserves Day provides not only an opportunity for Reservists to show pride in their service, but for the whole of the UK to recognise and celebrate the valuable contribution Reservists make to our Armed Forces. Reservists are a vital part of our Armed Forces and play a huge role in protecting the nation’s security at home and overseas. We are indebted to these men and women who give up their spare time to serve in the Reserve Forces so that should their country need them they are ready to serve; anywhere, anytime. As Winston Churchill said, ‘The Reservist is twice the citizen’. Reserves Day is an opportunity for all to recognise and celebrate the work of the Reserve Forces and the individuals themselves. We are extraordinarily proud of our Reservists, and it’s important we tell them as such and show them our support on this day.